It was a little over a decade ago when I began my work at home career. It all started when I stumbled on a deal site that offered free stuff. I'm a sucker for free samples. After a few months, I started getting into the deal portion of the online shopping and coupon site. I expressed interest in working for the deal site. After training and a lot of hard work, I was hired. That's obviously the in-a-nutshell version. One of the things I learned early on is that the cost of shipping could make or break a deal. For example, let's say I found a great deal on a pair of name brand headphones. The original price was $75, but they were on clearance for $12. That's a killer deal. However, if shipping was $9.95, it diminished the greatness of the deal. If shipping was free or below $5, a lot of people took advantage of the deal. Throughout my deal site career, the challenge was finding great deals with reasonable shipping, flat rate shipping, free shipping with a minimum purchase, or online coupons for free shipping. When we launched Bodacious Biscuit Love almost 4 years ago, I kept the "shipping can make or break a deal" at the forefront of my brain. We didn't want to limit people from getting their hands on homemade peanut butter dog treats for their furry kids. In lieu of that, we offered flat rate shipping. Shipping was $5 for a small box of 1-4 bags and $7 for a medium box of 5-8 bags. The flat rate shipping didn't cover the entire shipping cost. That included boxes shipped to locations here in Connecticut. 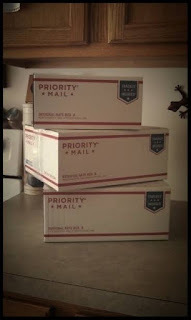 For every box shipped locally, we were forking out between $2 and $4 out of our own pockets. Locations outside of Connecticut were even more expensive and well exceeded our flat rate shipping fees. One year, we shipped a medium box of biscuits to Nevada. We charged the $7. The shipping cost was $22. In addition to the boxes of biscuits that people purchased, we were shipping biscuit love to animal shelters. The little money we made from selling our biscuits was used to purchase ingredients, supplies, and to cover shipping costs so we can spread biscuit love to our local animal shelters. The shipping costs ate up most of our funds. This is why we've always run partially and mostly out of pocket. Now, since pulling all but one of our displays and sharing our recipe, there are weeks we make nothing. This went on for a couple of years. We finally got to the point where we had to make some changes. And, we did. The flat rate shipping fees were only offered for Connecticut residents. We had a different set of shipping fees for those who lived in the New England area. The rest of the states were at cost shipping. In other words, if you lived in Texas and wanted biscuits, you had to pay the entire shipping costs. Finally, about a year later, when we made a considerable amount of changes, we made the decision to discontinue out of state shipping on the biscuits. A year ago, when we started making DIY Dog Mom Projects and selling them, once again, I was faced with the issue of shipping. My dilemma was that I wanted to offer shipping to those who weren't local. However, I didn't want to make the same mistake of forking out a ton of out of pocket money to cover a portion of shipping costs. Towards the end of last year, I tinkered with shipping first, letting the customer know how much, then they could pay. I called it the honor system. Most of the people who grab items are those we're familiar with. This worked out awesome because the DIY Dog Mom Projects range anywhere from quilts to the wood decor of all sizes and shapes. The boxes or shipping envelopes we use varied in size and the weight did too. However, like with most anything else, there are always a few who ruin that. Last year a few people didn't pay us for holiday ornaments and a couple of DIY Dog Mom Projects we shipped. We also ran into another issue. Checks. We'd ship an item and 3 weeks later, we still hadn't received a check. I hate having to send messages and emails inquiring about payment. In the here and now, we're still trying to iron out the details. If someone wants to purchase a $15 DIY Dog Mom Project, will they be willing to pay the full shipping charge? Because again, the shipping charge makes or breaks a deal. If we opt to pay a few dollars to help cover shipping, that's taking away from the money we're making. Which, isn't much. I try to keep the prices on the low end so everyone can enjoy having a handcrafted piece in their home. If no one wants to pay shipping charges, we're in a situation of having a narrow audience of interested people. That leaves us with local people who can pick up or within a reasonable distance for us to deliver. The struggle is real. I need to look into this more. I need to figure out a solution that's going to work for everyone.